ubsets of patients with multiple sclerosis. Neurol Neuroimmunol Neuroinflamm. 2016;3(5):e278. doi: 10.1212/NXI.0000000000000278. eCollection 2016 Oct. OBJECTIVE. We investigated T cell responses to myelin proteins in the blood of healthy controls and 2 groups of patients with relapsing-remitting multiple sclerosis (RRMS) who exhibited lesions either predominantly in the brain or predominantly in the spinal cord in order to assess whether distinct neuroinflammatory patterns were associated with different myelin protein-specific T cell effector function profiles and whether these profiles differed from healthy controls. METHODS:Peripheral blood mononuclear cells were obtained from patients with brain-predominant RRMS, patients with spinal cord-predominant RRMS, and age-matched healthy controls and analyzed by enzyme-linked immunosorbent spot assays to quantify interferon gamma-secreting (Th1) and interleukin 17-secreting (Th17) cells responding directly ex vivo to myelin basic protein (MBP) and myelin oligodendrocyte glycoprotein (MOG). Although MBP and MOG elicited different responses, patients with multiple sclerosis (MS) who had spinal cord-predominant lesions exhibited significantly higher Th17:Th1 ratios in response to both MBP and MOG compared to patients with brain-predominant MS. Incorporating the cytokine responses to both antigens into logistic regression models showed that these cytokine responses were able to provide good discrimination between patients with distinct neuroinflammatory patterns. 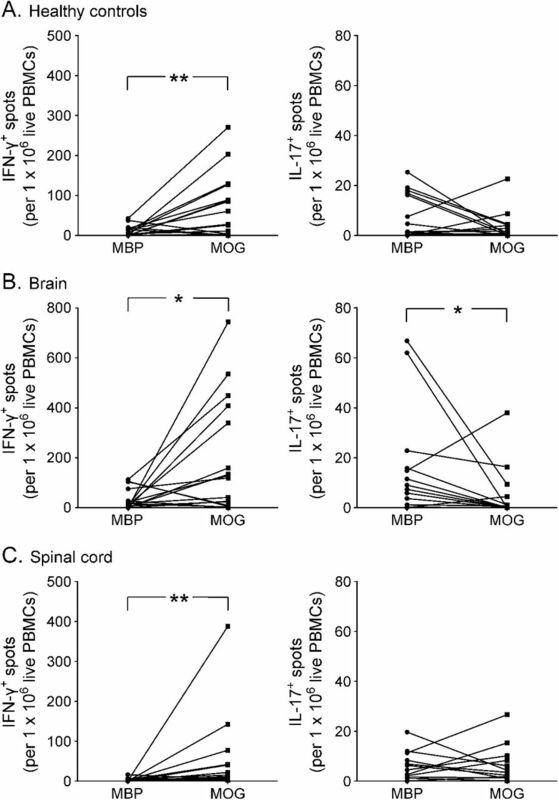 For IFN-γ+ and IL-17+ PBMC responses, the frequencies of MBP-specific vs MOG-specific cells are compared for each individual in (A) healthy control, (B) brain-predominant, or (C) spinal cord–predominant multiple sclerosis patient groups. Asterisks indicate significant differences in the frequencies of MBP- vs MOG-specific responses. *p < 0.05, **p < 0.01, ***p< 0.001, Wilcoxon test, 2-sided. IFN = interferon; IL = interleukin; MBP = myelin basic protein; MOG = myelin oligodendrocyte glycoprotein; PBMCs = peripheral blood mononuclear cells. (A) Pair-wise comparisons of the MBP-specific IFN-γ+, MBP-specific IL-17+, MOG-specific IFN-γ+, and MOG-specific IL-17+ responses are shown for all HCs (blue circles), patients with brain-predominant MS (red squares), and patients with spinal cord–predominant MS (green triangles) for whom responses to both myelin antigens were determined. It has been suggested from EAE studies that there can be two types of EAE the classical type that revolves around spinal cord disease and a brain type of disease, which are caused by Th17 cells. This study suggests that people with spinal lesions have a low MBP Th1 responses but a high MOG Th17 dominated response. However, if MS is not due to myelin autoimmunnity, as proof that this is the problem is lacking, what does this mean? Blocking IL-17 to inhibit TH17 only reduced brain lesions by about 50%, which is worse than beta interferons that is reported to inhibit gamma interferon production that should drive gamma interferon. Is this the reason? Does this work say targeting Th17 is a waste of time because it will miss the stuff causing disability? In mice the same group had suggested that IL-17 made by TH17 cells cause brain lesions in mice. However these lesions were predominated by neutrophils not mononuclear cells and pathology tells us that the lesions in MS are more mononuclear and this is not just old lesions because they are seen in brain biospies too. Repeat of this work independently and quickly is going to be critical and because the data shows so much overlap in terms of cytokines levels the conclusions are more convincing than the data. Humans and marmosets with EAE get more brain lesions than rodents. Is it they have more white matter in their brains. Is this a new argument why PPMS, who may have more spinal lesions may not respond, like people with RRMS who have brain lesions. Does this fit with the past literature? Where Th17 or Th1 predominated responses have been reported? We had the Th1 = bad Th2= good mantra generated by a few labs (I think Th1 =bad, Th2= bad) and when we took cells from the beasties and looked we could find gamma interferon and never IL-4 so always a Th1 response. Then I got the pleasure of refereeing a paper and got them to really reference how it was done rather than using a reference that said nothing.